Bearded looks can be great but if you are someone who prefers the "clean shaven" look then an electric shaver should be a "must have" on your list. When it comes to good electric shavers, finding the right one can nearly be impossible thanks to the hundreds of options out there. This is the reason why we have created a list of TOP 10 best electric shavers 2017 to choose the best one that suits for you considering the skin type and hair. If you take electric shavers then there are many products available in the market, few are really good when it comes for smooth shaving while some are good for comfortable shaving without causing any irritation to your skin. So, what is the best electric shaver to choose? Well will find out soon! There are factors could vary from something as simple as "purpose of shaving and usage frequency" to the type like wet or dry shaver. The factors revolve around ease of use, duration of use, type of beard, cleaning of the razor or razor blades, mobility, ergonomics, replacement blades, and last but not the least, price. Our top 10 list takes a look at the Best Electric Shavers available, from the shaving experience to the comfort level. And this list will help you to choose the electric shaver which suits you the most. I would recommend to c﻿heck﻿ our Electric Shaver Buying guide below before making a purchase. Let's get down to check the best electric shavers without wasting any time. Braun is one of the highly popular men’s electric shaver brands across the world and is a wholly owned subsidiary of The Gillette Company. The Braun Series 9 9090cc shaver is equipped with the best of both worlds - German modern industrial design as well as state of the art technology and functionality. That's not all, it is one of the best rated electric shavers in critic's lists and hence, without any doubt Braun 9090cc shaver seals the top spot in our list. This shaver is a flagship product of Braun's breakthrough SyncroSonic technology, which simply means with a fully flexible SyncroSonic shaving system fully you can experience the world’s most efficient and comfortable shave. This functionality is a feat has been achieved as well as tested on 3-day beards. The Braun Series 9 electric shavers came out with best electric shavers for men and now the Braun 9090cc is considered to be in the same league. It possesses an advanced shaver head that initiates 40,000 cross-cutting actions per minute thus making is capable of cutting through almost all types of facial hair rapidly. The Braun Series 9 9090cc electric razor is truly a must to have men’s electric shavers list that gives you the best shaving experience with all new cutting head focuses on three functionalities. The Direct and Cut Trimmer aligns and cuts the hair growing in different directions. The Hyper Lift and Cut Trimmer lifts and cuts flat lying hairs easily and effortlessly from chin and neck are that usually challenging to cut using any normal shaver or razer. This Razor comes with the 2x OptiFoil for the perfect finish and provides closer shaving than any other shaver. This is an electric razor for men that has been designed to handle all types of beard but especially where beard growth is multi directional. It also comes with an integrated skin friendly Precision trimmer feature for easy and accurate sideburn shaping. There are many reasons to like Braun-9090cc electric shaver but its 100% waterproof feature is liked by most users, it can be submerged in water up to 5 meters deep, fully washable and allows you to rinse it under running water for easy cleaning. This features makes the Braun-9090cc shaver as Best water proof electric shaver to clearly stand out from other electric shavers available in the market. Braun-9090cc electric shaver comes with advanced clean and charge technology and it is the world’s only 5-action, alcohol based Clean and Charge Station. The charge station hygienically cleans, charges, and lubricates the shaver in addition to that it also selects a cleaning program and dries the shaver at the touch of a button. Overall Braun Series 9090c is a most efficient and comfortable men’s electric shaver that comes with advanced clean and charge technology, 100% water proof and precision trimmer designed to make a difference and Proven to work on even 3 day beards. Also, It comes with ergonomic Braun Design with highest Braun quality material tends to be the ultimate and best men's electric razor. Yes, Panasonic is a brand in itself and a global leader in consumer electronics and home appliances but, can they really offer great shavers? Yes, most definitely Panasonic ES-LV65-S Arc5 electric razor makes a really strong impact in the list of top 10 men’s electric shavers list. Most critics believe that this foil shaver is the best electric shaver for sensitive skin that they have come across and why not? Also, there cannot be any electric shaver reviews without featuring the Panasonic electric razor machines. The ES-LV65-S is one among the top rated electric razors for men and has been designed around Panasonic's Nanotech Blade Technology. There are five heads in the razor and each contains next generation nanotech blades that are ultra-sharp blades and quite capable of delivering hundreds of precision shaves without losing it performance over time. The blades are highly hypoallergenic and great electric shaver for people with sensitive skin. Now, let's move onto the multi-Flex heads of the ES-LV65-S Panasonic electric shaver. This ES-LV65-S is a best electric shaver for men which delivers a truly impressive shaving experience. The multi-flex heads can easily shave without any difficulty along the contours of your face. The multi-flex heads have been created using two different technologies and they are Microfoil Lift-Tech Foils and Active Shaving Sensor. The Microfoil Lift-Tech Foils technology enhanced each head with 3 micro-thin overlapping foils that enable the capture of each and every hair on the face. The Lift-Tech foils use a reverse-tapered edge that vibrates the stubble to make it stand up thus giving way to a much superior shave. The active shaving sensor in the machine is truly an innovative technology and makes the Panasonic ES-LV65-S the perfect shaver for sensitive skin. The active shaving sensor helps in adjusting the power to the heads so that you can shave sensitive areas like the jaw-line, mustache, neck, and chin area without a scratch. Overall Arc5 premium Arc5 pansonic is definitely one of the best cordless shaver provides close and comfortable shave every time. It represents Panasonic’s best electric shaver system to date. The premium Panasonic Arc5 electric shaving system makes it easy to comfortably shave all the hard to reach areas of your face like chin and neck. This shaver comes with most expected Wet/Dry shaving feature and The Panasonic Arc5 Electric Razor is voted as the perfect shaver for travel with universal voltage, travel safety lock and travel pouch. If you thought you have seen the best electric razor for men already a lot then here's another surprise contender for the top spot in the 10 top rated electric razors list. The Panasonic Arc5 ES-LV95-S electric razor is 2014’s Men’s Health Grooming Award winner and definitely one of the best electric shaver. This shaver is still selling hot. Why? This is simply because the ARC 5-Blade Series has extensive innovative features including the highly successful Skin Comfort Foil System. Panasonic ES-LV95-S is a cordless electric shaver that promises nothing short of an enhanced shaving experience. The Arc5 can easily be stamped as the closest shave electric razor head product as its foil cutting system contains 5 ultra-thin blades at 30 degree angle. The three different foils as well as blades are made from stainless steel. The Life-Tech foil in the Panasonic ES-LV95-S contains reverse tapered edges that are meant to cut any hair that lays flat on your face. The finishing foil is the "grim reaper" of sorts and will cut those hairs that would otherwise escape when using any other razor. The third is slit foil, which has been designed for cutting long hair like the ones in beard or even sideburns. The end result of shaving is that your face and chin will feel smooth and remain soft. 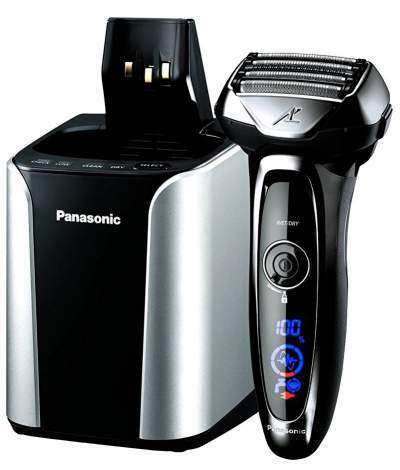 One of the salient aspects of the Panasonic ES-LV95-S is the state of the art Panasonic cleaning system that is meant to keep your shaver in optimum working state. It's easy to clean thanks to the sonic vibration mode that necessitates a quick clean. One of the best rated men’s electric shavers in the market, the Arc5 has been created for those men who prefer a more traditional foiled head. Overall ES-LV95-S Panasonic shaver has got all the features of ES-LV65-S like Arc5 Shaving system, Active Shaving Sensor and flexible micro foil patterns. What makes the difference is the Premium Automatic Cleaning and Charging Station which is 100% washable and rinses clean under running water with sonic vibration cleaning mode. It is an ideal electric shaver for men Grooming On-the-Go. If you talk about the best-selling electric razors and the one that comes to the mind is the Philips Norelco Electric Shaver 9700 S9721/87. This is one of the best cordless shaver in the rotary shaver category that is available in black finish and is high on mobility as well. 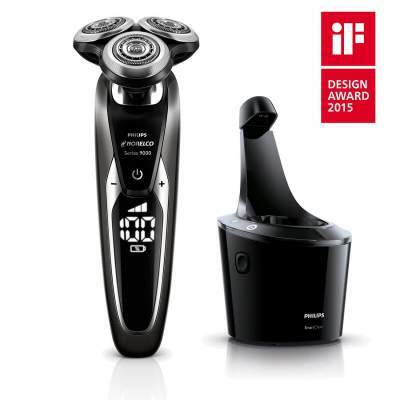 Philips Norelco Shaver 9700 is not only the most advanced shaver but also the “2015 iF Design Award winner” for its sleek design. What is special in Philips Norelco from other electric razors? Unlike the Braun 9090c or the Panasonic ESLV-65S, the Philips norelco 9700 electric razor has three Contour Detect shaving heads and each head works together as well as separately. The three heads provides not only the fastest and cleanest shave but also upholds the value of precision shaving. Each of these heads has the ability to move in 8 different directions and this enables them to follow the curves on your face. Each of the heads contains V-Track precision blades, which have the ability to trim hair closely minus the any pulling or tugging. These V-Track blades can also self-sharpen and hence you will never have to worry about their performance getting dulled over a period of time. 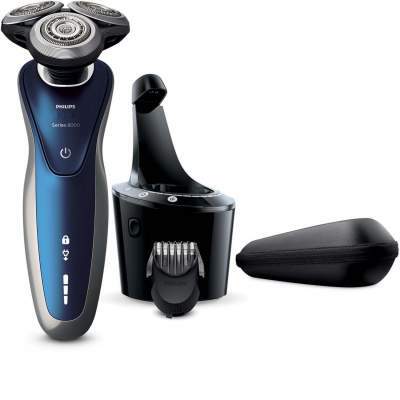 Here's something that makes the Philips Norelco S9721/87 Shaver 9700 one of the best electric shavers for men; you get a separate cleaning and charging unit along with the shaver. All you have to do is insert an alcohol-free conditioner at the bottom of the cleaning unit and you are ready to go. The active lubrication system will do the rest! When using the shaver you can choose from 3 different speed settings. There is the slow speed that enables a skin-friendly shave meant for those with sensitive skin. The medium speed provides a rather thorough shave while the fast speed is meant to provide a high-powered quick shave. With Philips Norelco Shaver 9700 Now you can follow every contour of your face and neck with 8-directional Contour Detect technology. It remove 20% more hairs in every single pass that resulting in providing an extremely close, smooth shave. Having come half-way down the list, you will probably expect the best electric razor for beards to dwindle in features but honestly, that's not how it is going to be. This is a list of the best of the best and hence, we bring to you the Rechargeable Shaver 8061 by Wahl Clipper Corporation. The Wahl Professional 8061 5-Star Shaver is great in terms of performance and has gained popularity among men with sensitive skin. This is a shaver that has been created for those men who want a smooth shaving experience but don't have the budget to pick up a Braun, or a Panasonic. The 8061 rechargeable shaver comes with wide yellow foil-style shaving blades that promise to provide super close shave. In fact, the popularity of this device went sky high post release of the movie "The Martian" where Matt Damon shaved off his beard using a Wahl shaver. Coming back to the shaver, the wide foil head is complete with a long slender design to promote its use as a shaper. 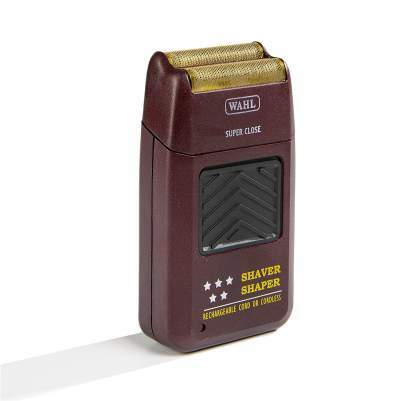 One of the salient aspects of the Wahl shaver is that it performs efficiently on a variety of men's hair. No wonder, this was judged as the best electric razor for men in 2014 and it is still going strong thanks to its versatility. It can take care of fine or super fine hair along with thick and coarse beard. It is also quite ideal for trimming side burns and is near perfect for that three day stubble. 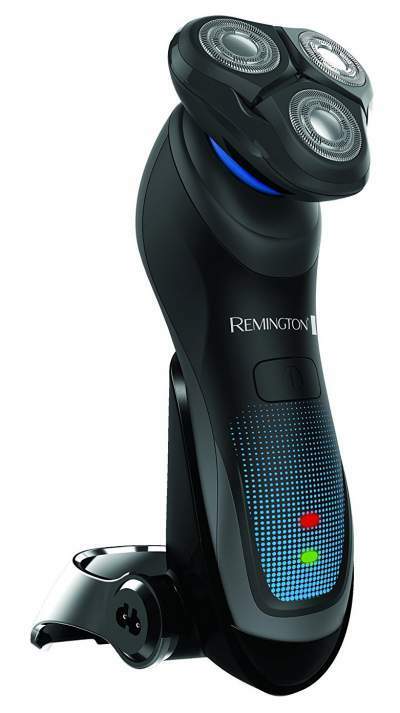 If you are looking for best rated and cheap electric razor around and under $100 then Remington XR1430 rotary electric razor with HyperFlex technology is just that and much more. Closeness. Comfort and Power, That’s Remington XR1430 electric shaver provides with its Maximum Comfort HyperFlex Advanced Rotary Shaving system. The HyperFlex design allows the shaver head to detect the contours of your face, with a pivoting neck and three floating rotary heads that tilt and flex independently to provide consistent smooth shaving skin. As affordable as the Remington XR1430 looks, it is definitely not to be counted out thanks to a variety of features. To start with, this shaver has been made with innovative HyperFlex design allows the entire shaving head to adjust to any angle, helping to reduce irritation and provide a smooth, comfortable finish. The shaver head pivots seamlessly to stay in close contact with the skin on the neck and chin areas which are using difficult in reaching out. Overall Remington XR1430 electric razor comes with HyperFlex design and advanced Rotary Shaver system to prove a super close, comfort and smooth shaving experience in the shave areas like neck and chin that are tough to reach. It comes with cord or cordless operation mode for flexible use. But sadly this electric shaver takes 4 hours charging to provide 60 minutes of cordless shave before recharging again. However the fast 5 minute quick recharge for morning shave and LED battery-power indicator is huge plus factor for this razor. The Remington razor operates very quiet and the blades are water resistant makes it easy to clean and wash. This is the second Braun shaver on this list and why not? Braun electric shavers are considered to be the World’s most efficient shavers and the Series 9 with intelligent sonic technology that provides the ultimate shaving experience. The intelligent sonic technology in Braun Series 9-9095cc enables a mind boggling 30,000 cross-cutting actions per minute. The intelligent sonic technology of the razor checks the density at 160 times per minute, reads, and automatically adapts and provides extra power to your beard. 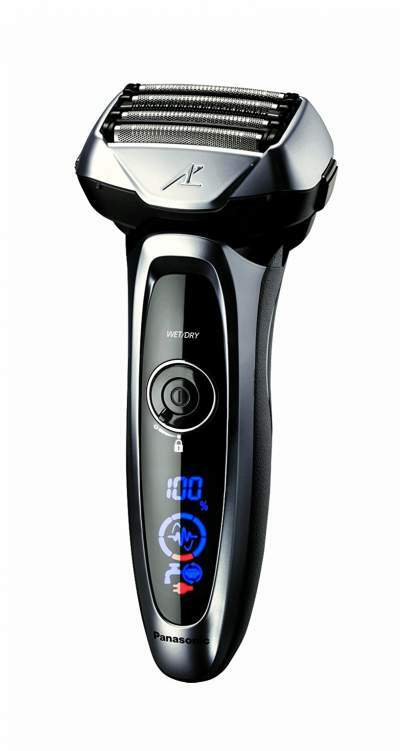 The technology enables 10,000 micro-vibrations per minute ensuring the shaver does not miss out any flat lying hair. This "Made in Germany" shaver has the unique Braun design aesthetics but the salient aspect is the different blades. It is a 4-in-1 shaver that contains 2 OptiFoil heads, which provides super close shave for a lasting smooth experience. This makes it as one of the best close shave electric razor available in the market today. 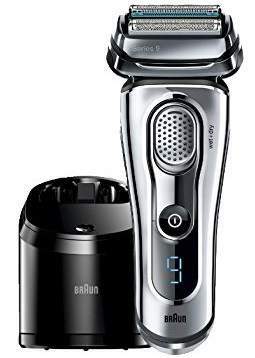 The Braun 9095cc has a Direct & Cut trimmer head that has the ability to capture beard hairs growing in almost all directions. Lastly, there is the HyperLift & Cut trimmer, which enables the lifting of flat-lying hairs and cuts them with ease. Last but not the least; this impressive shaver comes with a five action cleaning system that also acts as the charging unit. An integral part of the package is the cleaning cartridge that contains the cleaning solution. As the title suggests, it can handle both dry and wet shave. If you are someone who likes to shave using shaving foam or wet your face then this is the best electric shaver for your needs. Overall Braun Series 9-9095cc electric razor provide you the most efficient and comfortable shaver for skin. With its Quadruple action cutting system does the trick for maximum facial hair removal on every single move is a huge plus. Also it comes with a LED battery display for battery status, hygiene indication and travel lock indicator clearly makes it as the best electric shaver standing tall in the Cordless Shaving System. This sleek and stylish razor has an ultra-track head that has been designed to make shaving a smooth affair for 3 different types including short stubble, medium length and longer beard hair. The track created for longer hair removes the need for a trimmer prior to shaving. The primary feature is the three small rotary heads that move in 8 different directions. The 8900 heads contain V-track precision blades that perfectly guides beard hairs for a close and smooth shave. In order to make close shaving possible, the shaver has been incorporated with a super lift and cut action, which enables lifting of flat lying hairs. The V-Track precision blades are patented and allow cutting 30% closer and in fewer strokes. An interesting feature of the 8900 is the beard styler. It is a click on and off system that will enable you to trim around your sideburns, moustache, as well as eyebrows. The SmartClick beard styler has a comb like structure and rounded tips, which prevents skin irritation. You can also take advantage of the 5 different length settings of the beard styler thus making it possible to sport a beard look that you desire the most. This makes it one of the best norelco shavers for men in 2017. Sometimes brands do talk and especially when it is a German Mega brand like Braun. 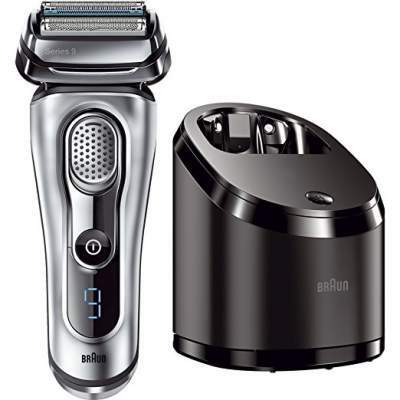 The Braun Series 9 9093s belongs to the Series 9, which is considered as one of the most efficient shaver in the world. No wonder, it has remained as the best electric shaver for men lasting for many months. So, what is really different about the 9093s? The sleek urban steel design is definitely something that will catch your eye but that is not the primary feature. At the heart of the 9093s is Braun's patented SyncroSonic technology. This breakthrough technology has helped design a cutting system that features four different cutting elements that along with the power of Sonic technology provides a faster shave without irritating the skin. The intelligent sonic technology induces 10,000 micro-vibrations per minute so that more hair can be captured making the entire shaving process quite a pleasant affair. The Braun Series 9 9093s features a hyperlift and cut trimmer that lifts and cuts any flat lying hair in your beard. The direct and cut trimmer aligns as well as cuts the longer hair growing in different directions. There are two OptiFoil cutting foils that provide the closest and most gentle shave you can ever experience. The SyncroSonic technology makes cutting 3-day beards a walk in the park. One of the smart features that make the 9093s a top closest shave electric razor is the fact that the whole cutting head and each individual cutting blade can tilt right or left depending on the application of pressure. What makes Braun precision shavers different from others? 1. Unmatched closeness with help of Series 9 cuts more hair in one stroke challenges where normal shavers might fail. 2. Unmatched skin comfort - You don‘t have to go over the same spot twice for smooth shaving which significantly reduces the risk of skin irritation. 3. Premium shavers built to last a minimum of 7 years. The last shaver on this list of best electric shavers 2017 is the Philips Norelco s9311/87 and this is definitely a to have shaver. It not only comes highly recommended but its breakthrough contour detect technology is really something worth experiencing. The highlight of the contour detect technology is that it enables the razor to detect the curves and angles of your face or skin and this helps it to adjust properly while shaving. This is reason enough to own it because it will provide you with a much closer shave than you can imagine. This is not all, getting a closer shave without irritating or cutting your skin is definitely a plus point. Moving on to the shaving heads, the Norelco s9311/87 comes with 3 shaving heads and each of them is able to move independently in 8 different directions. The blades are v-shaped and highly precision blades. They have been designed to cut any facial hair the first time itself. One huge benefit of this type of blade is that it minimizes razor burn. Every shaver needs to be cleaned once in a while and hence the Norelco s9311/87 comes with a cleaning dock known as the smart clean functionality. It is a multi-purpose dock as it cleans as well as charges the razor for your next shave. If you thought, these were the end of the line of features then check this out: What makes it the best electric shaver is the Smart Click Precision Trimmer that can be easily clicked onto the shaver. It's a neat little gadget for styling mustaches and sideburns. The first ever electric razor patented in 1930 had a simple rotating or oscillating blade. Since then, advancement in technology coupled with innovation has given electric shavers for men a new lease of life. You will be surprised by the amount of features packed in these small devices but it is still important to go through the buyers guide. At the end of the day, an informed choice is always the best choice! Rotary Vs Foil Shavers: Which one to Buy? The electric shavers of today can be categorized under two styles: Rotary and Foil. Although they function in the same manner, there is a basic difference in their make. A Rotary shaver normally has three of four rotating heads like the Philips Norelco s9311/87. These shavers are effective for men experiencing thick or even fast-growing hair that tends to grow in different directions. They work by lifting the hair and cutting it without causing any irritation or cuts on your face. A Foil shaver on the other hand consists of thin metal foil covering the oscillating blades. Foil shavers are usually available in three or four-blade varieties like the Braun Series 9 9090cc shaver. A four-blade foil shaver is faster and shaves closer than its three-blade counterpart. They are highly effective for straight and long back-and-forth motion over your face and neck. This is another important aspect as most men have grown up using foams, gels, and shaving cream at some point in time. It is only today that technology has taken razor performance to an all new level. First things first, you will always find that the best selling electric razor is one that comes with the dual functionality of wet or dry shaving like the Norelco 8900. So, what is the difference? A dry shaver like the Braun 9093s has the distinct advantage because it can be used almost anywhere and at anytime. On the other hand, the wet shaver is meant for those who prefer to go with foams and gels or want to shave in the shower. This is another important factor to consider when searching for the best close shave electric razor. There are men with sensitive skin who are prone to razor burn and hence it becomes important to go with a razor that prevents razor burn while giving a close shave. Foil shavers are known to be less harsh as compared to rotary shavers although other factors like types of blade, and head functionalities should also be considered.